As an Occupational Therapist working in NHS addiction services, I was excited about being offered the role of Chair of the Service User Steering group by the South Ayrshire Recovery Orientated System of Care (ROSC) group. The Alcohol and Drug Partnership (ADP) in South Ayrshire recognised the importance of the ROSC and embraced the opportunity to invite people in recovery and supporters to be involved in shaping future service provision. I hoped I could use my leadership skills to establish a productive group. The group met monthly and the enthusiasm for raising the profile of recovery was noticed. The plan of having a local Recovery Walk quickly became a reality, thanks to the large number of people in recovery and supporters who became involved. Everyone working in partnership with a shared vision led to a very successful day. Approximately 250 people took part in the walk and despite the typical Scottish weather there was a recognition by all, that people in recovery have valuable knowledge and skills and deserve to be treated with dignity and respect. I hoped the RecoveryWalk was the beginning of reducing stigma against people with addiction issues in South Ayrshire. Following a number of successful gatherings at Ayr Town Hall, the Service User Steering became known as RecoveryAyr. Meetings about opportunities began and visits to other national recovery initiatives brought new ideas and inspiration. In December 2012, RecoveryAyr raised £1,500 for the Make A Wish Foundation at a festive, fun filled Christmas Fayre and pantomime – Tam O’Shanter The Mornin’ Eftir. I hoped everyone recognised the positive community spirit and enjoyed the outcome of effective teamwork. A request for skill development training was fulfilled for a number of interested individuals involved in RecoveryAyr activities. This helped to develop confidence, provide structure and routine and people began to realise their own potential. A self management WRAP (Wellness Recovery Action Plan) workshop was also offered. It was during this learning experience, I began to further contemplate the key concept of Hope. I hope others value the concept of Hope. June 2013 launched RecoveryAyr’s Café HOPE. On this occasion, HOPE is the acronym for Helpful Opportunities for People Everywhere. Café HOPE is a safe community space which offers individuals in recovery and supporters, a fun environment to come on a Friday night 5pm-7pm. The Salvation Army Community Church, Ayr have fantastic facilities where Café HOPE functions and has seen up to 75 people attend each week. The volunteers who are individuals in recovery and supporters are able to utilise their skills in many ways to welcome and encourage new people and participate in projects. I hope the future will see Café HOPE open in Ayr town centre, run daily by people in recovery. Like me, people in recovery and supporters have found an appetite for personal growth and discovery. 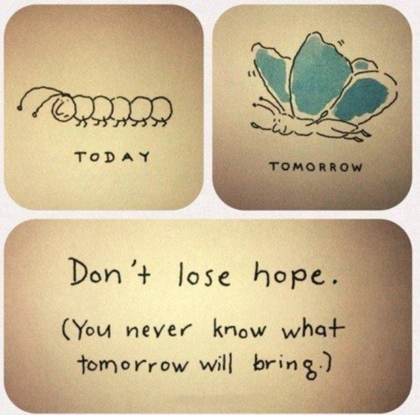 RecoveryAyr has brought about a transformation in individual’s lives and witnessed many caterpillars become butterflies. I hope this blog has instilled some Hope today. Next week sees a return to Ayrshirehealth for @kerryahpaa (Head of Profession – Occupational Therapy). Well done Claire, without hope we have nothing !